If you have a nagging urge to read this article, I’d imagine that you’ve been a Windows user throughout your technological life. Switching from one operating system to another (in this case to a Mac) is far from easy, especially when the two operating systems have so little in common. Uprooting yourself from a perfectly safe and familiar surrounding which you were enveloped in while using your PC and switching to a Mac may be uncomfortable and in fact, downright awkward. But trust me, once you understand the difference between the two and learn to adapt to the “Mac style”, the dust should inevitably settle and perhaps you’ll eventually enjoy using a Mac. This switching to Mac guide or call it a crash course will be a stripped down version of most tutorials on how to use a Mac. I will only touch on the bare essentials and hopefully that will make your learning experience a less complicating one. If you’re looking to install an application in Windows, most likely you’d have to double-click on the setup.exe file to run in the installer. Sometimes, an app will come with an installer. Simply follow the instructions and you’re golden. If you need to remove an application in Windows, you’ll have to head into Control Panel -> Add/Remove Programs. On a Mac, because most apps are self-contained, all you need to do is drag the app from your Applications folder to the Trash. Finito. In Windows, Control Panel is the operations center. Everything you need in order to change any settings will be found there. On a Mac, you’ll need System Preferences. It can be accessed from the Apple menu, located in the top-left hand corner or in the Utilities folder (Applications -> Utilities). Every customizable setting — from display font size and screen saver patterns to Bluetooth and Printer Sharing — will be found there. If you can’t seem to locate the setting you need, use the Spotlight search field within System Preferences to narrow down the possibilities. If you need to explore the contents of say, the Program Files folder in Windows, you’ll definitely use Windows Explorer and would presumably start by double-clicking My Computer. On a Mac, what you would use is the Finder. Click on the Finder icon (the smiley face) on the Dock and a new Finder Window will open, displaying the contents of your Home folder. From there, you are able to access your Applications, Documents, Downloads, Movies, Music and Pictures folders. Most Windows keyboard shortcuts revolve around the Control button. To copy — Control + C, to paste — Control + V and so on. On a Mac, the big kahuna is the Command button. It’s located next to the spacebar and has a clover icon on it. You’ll definitely need to reprogram your fingers (your thumb, actually) to hit this button instead of Control. For a complete list of commonly-used Mac OS X shortcuts, refer to MakeUseOf’s Cheat Sheets 10 Essential Cheat Sheets To Download 10 Essential Cheat Sheets To Download Read More page. The regular rigmarole to go through if you need to launch an app in Windows would be to click on Start, then go on from there depending on how you have your Start menu customized. On a Mac, the Dock is where you’ll start. Drag all of your favourite apps — internet browser, instant messaging client, music player, movie player, etc — from the Applications folder onto the Dock for easy access. If something went wrong while using a Windows PC, most users will instinctively press the infamous Control+Alt+Del key sequence to invoke the Task Manager. On a Mac, if an app isn’t responding, your safest bet is to force it to quit. You can do this by right-clicking the app’s icon on the Dock and click on Force Quit. Alternatively, you can learn to use Mac’s task manager — Activity Monitor Macnifying OS X: Learning To Utilize Activity Monitor on Mac Macnifying OS X: Learning To Utilize Activity Monitor on Mac Read More . If you get a whiff that your Windows PC is starting to clunker and slow down, the obvious easy-fix is to use Window’s Disk Defragmenter. On a Mac, fragmentation is automatically dealt with by the operating system so you don’t need to worry about that. If you notice your Mac starting to slow down, take a look at some optimizers in this article Ten Tools To Keep Your Mac In Tip-Top Shape Ten Tools To Keep Your Mac In Tip-Top Shape Read More and here for a couple of tips to keep your Mac running smoothly 5 Cool Mac Optimization Tips to Get The Most From Your Mac 5 Cool Mac Optimization Tips to Get The Most From Your Mac We've all been there. Every computer has this problem. Whether you use a Mac, PC or Linux; your system, at one point in time, will start feeling sluggish and less responsive. Read More . Many (even seasoned) Mac users will advise you to run Disk Utility to repair file permissions as a cure-all for Mac slowdowns. I have to point out this is a myth. Repairing permissions deals with a very specific issue, read more about it here. I hope that this crash course helps any recent Mac Switchers out there to comprehend the alien (albeit very pretty) operating system before them. I can’t emphasize the importance of user experience here. You’ll only learn to master a Mac after you’ve used it for some time and no tutorial can completely substitute your personal learning process. There is no 'side'. Certain computers match certain people, that goes for Windows, Linux, and Macs.... until you realize each has it's own benefits and drawbacks, this silly argument will continue. If you truly have an open mind, then you will see this clear as day.... why does everything have to be "I'm better than you?". Seriously, why ? Pretty childish, and a complete waste of everyone's time. Grow up. Overall, good article, I'll save time and say I agree with the above comments. "A Windows Userâ€™s Crash Course In Switching To A Mac"
I don't see why someone should switch from using any computer, why not just use both? I have a mac and a windows machine (and linux, but that's beside the point), and I use both for different things. Even if you don't own a mac or own a PC you should still know how to use the other, to me it just seems like common sense. Thanks, that's great advice. Be sure to tell that to everyone you meet. I agree with most of the comments that a lot of things were left out and some things just simply wrong. If its true that this was written for the very basic of users. What very basic windows user switching to mac would know what it is to mount and image or unmount an image. This would be very foreign to them yet the article states nothing about what it is to mount an image or how to even unmount an image. I mentioned what images are and how to mount them. How to unmount? Well, right-click the disk image icon on the desktop and select Eject. Or click and drag the disk image icon (from the desktop) to the Trash. I'm giving this to my wife. I'm encouraging her to come over to the Mac side! Thanks for the article, Jackson, and did you use Skitch to annotate? The arrow shapes look familiar. I'm glad that you found it useful and yes, I did use Skitch! Personally, it's the simplest and most convenient tool to use for screenshots and annotation. Switching from one operating system to another (in this case to a Mac) is far from easy, especially when the two operating systems have so little in common. Most of the article is straight forward and informative, but I disagree with the above statement. The reason people have trouble switching is because they have so much in common not so little and because they recognise almost everything and it is when the little commands or actions they are used to don't work that causes the difficulty. If, for example, you use a Linux flavoured OS for the first time then although the windows-ness of KDE is familiar you will find it much easier to use one of the other window managers to actually use the system, because you don't have preconceptions on how it should work that are already deeply ingrained and you often do without even thinking. It depends on who you present the new operating system to. If I were to take away the Windows PC away from my mother and dropped my Mac in front of her, she wouldn't know where to start. Hey Mack - one question - who'd want to switch anyway?? I am a 'Windows User' with no intention on switching to Mac, however I found this article informative, useful and relevant. Its title specifies that it is a crash course for Windows users switching to Mac. 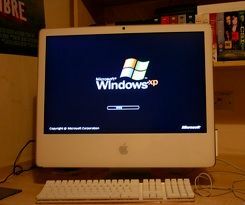 It was plain, simple and to the point, and will probably make some Windows users less afraid to try a Mac. I have used both, but have chosen to stick basically with Windows for many reasons, however if I was switching, this would have been a very useful primer. Nice article! I find your Mac articles informative but a little on the light side. I suspect that most MUO readers are technically savvy users and would appreciate more of the stuff that happens behind the scenes. BTW, I read through the Mac Manual you wrote and also found it to be light (in the sense that savvy Windows users would generally pick this stuff up without even reading the manual). Looking forward to your next article. I am extremely curious about uninstalling programs (keeping a clean system), command line info (cli-scipting), GUI-script writing on the Mac (perhaps Mac versions of AutoIt, AutoHotkey, RapidBatch, etc..), firewall/malware solutions, running personal servers. All real world stuff without the salesmanship (that is... all OSes have their faults - I'd like to hear about them so I know where the fixes need to be). Thanks for the constructive criticism. I'll look into more advanced topics for the technologically-savvy readers, for sure. You should update your article's System maintenance part to include current info on Windows systems. Defragmentation in Windows 7 runs automatically in the background with minimal impact to foreground activity. If solid-state media is detected, Windows disables defragmentation on that disk. You probably know that the physical nature of solid-state media is such that defragmentation is not needed and in fact, could decrease overall media lifetime in certain cases. Defrag on boot is another options in Windows 7 and it enables you to defrag system and registry. Thanks for the information. I guess the title should include XP in it, huh? On a Mac, if an app isnâ€™t responding, your safest bet is to force it to quit. You can do this by right-clicking the appâ€™s icon on the Dock and click on Force Quit. yeah, or you can use Alt + Cmd + Esc to bring the 'end application' window. Good tip, thanks for reminding me. Sometimes the window doesn't appear right away so you have to wait for a little while, especially when the system isn't responding. Good points, but I find it extremely misleading to keep claiming that all you need to do to uninstall applications is to drag them to the trash can... for most medium to large applications that's completely untrue and leaves tons of preference files and folders in your computer. It drives me nuts how Mac users (and I am one) claim that this is so much quicker than in Windows. Hey, it would be a lot quicker also if you just dragged the program's folder in Windows into the recycling bin, but that doesn't mean it's been deleted. I personally use AppTrapper to clean up preference files when I uninstall apps, but I still don't feel like I'm getting everything off of there. To be strictly puristic, apps that are added via an installer should be removed with their provided uninstallers. Not to mention, this article was styled to make it less complicated to understand hence, the drag straight to Trash. Even apps that do not have an install create Preferences files and other various files left in both the user and system libraries (very, very similar to Windows apps creating folders in AppData\Local and \Roaming). The only real difference is the Registry on Windows. As long as an application was launched, it will create a preference file. For a new Mac user, this won't matter very much. It won't hinder the system. The ease of transition is more important here. After they have gotten into the groove of using a Mac, then it will be fair to bring uninstallers into the equation.